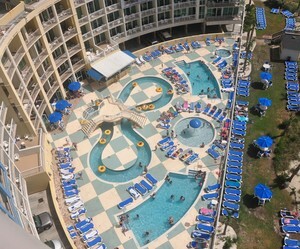 Located in North Myrtle Beach, this oceanfront resort is truly a special retreat for families and couples. These luxurious 1, 2 & 3 bedroom oceanfront Myrtle Beach condos feature all the comforts of home, but with a view of the ocean you will only find at the Avista. Each tastefully decorated and fully furnished condo features glass-paneled oceanfront balconies - truly something special to enjoy the views of the Atlantic! In addition, The Avista offers an on-site restaurant, lounge and pool bar. Just a short walk away is Main Street, home to many shops, restaurants, night life options and attractions. This is a very family friendly area of North Myrtle Beach, that truly has something for all ages to enjoy.